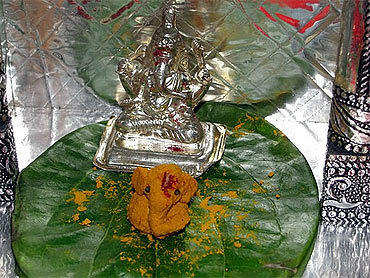 Rohit Pradhan from Thane sent us this photograph of Lord Ganesh. 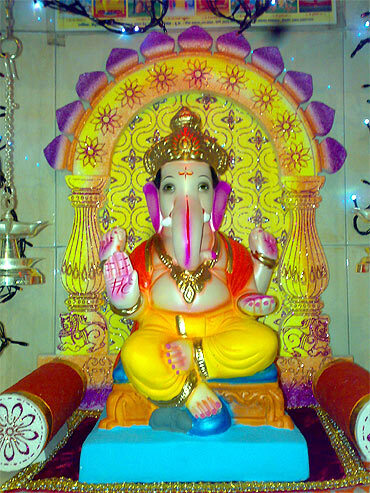 Rohit's grandfather first bought a Ganesha idol home in 1941. Praveen & Prachi Shivsharan sent us this photo from Santa Clara, California. 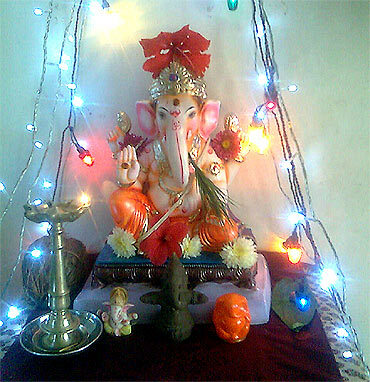 Prabhakar and Rasika Shetty's from Vile Parle, Mumbai sent us this picture. 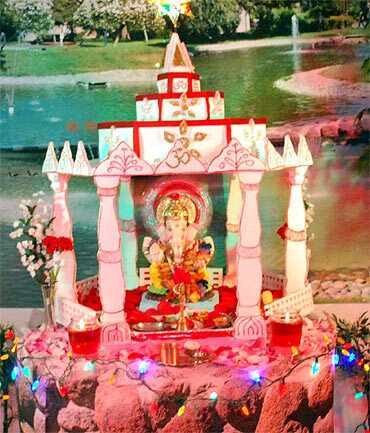 The couple installed a Ganesh idol for the first time at the request of their little daughter Naisha. 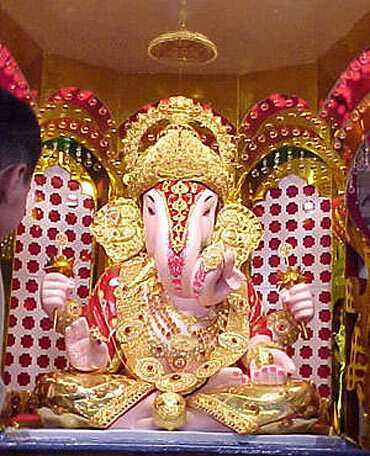 Son Swami was cheer-leader in the celebrations..
"Imagine an India where every Christian celebrates Ganesh... Where every Hindu celebrates Eid... Where every Muslim celebrates Christmas... Imagine how that would frustrate our communal, divisive politicians and fanatics," writes Remo Fernandes from Goa. 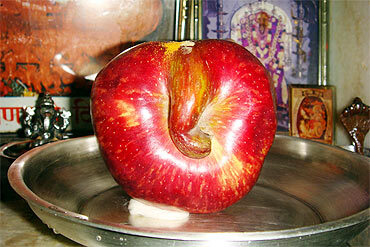 Suhas V Haldankar has sent us this photograph of an apple which has the out line of a Ganesha. 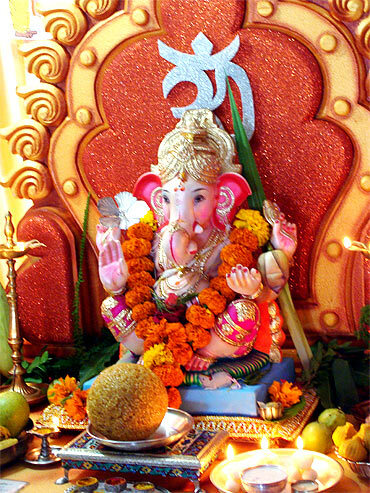 He says that he procured this apple during the Ganesh festival! 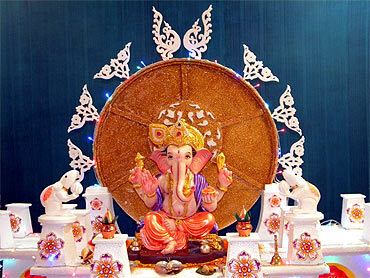 Sushil Kadam from Mumbai has sent us a photo of Pune's famed Dagdusheth Halwai Ganpati. 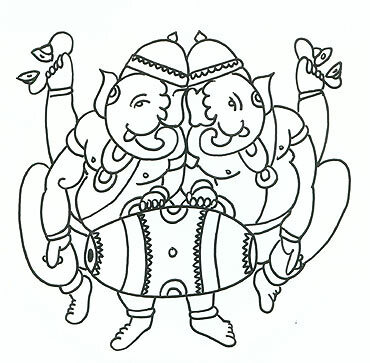 The Shrimant Dagdusheth Halwai Sarvajanik Ganapati Trust, based in Pune, was established in 1893, when Lokmanya Tilak gave a public form to the Ganpati celebration. 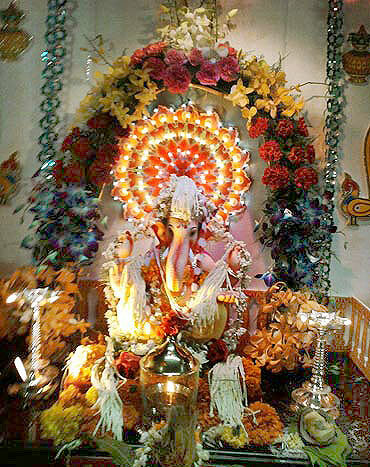 Satish Gowdra of San Jose, California sent us this pic of Ganesha at his home. 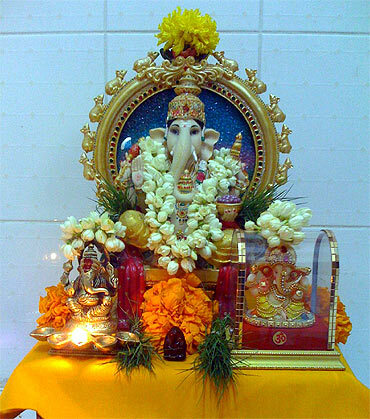 "This is the ninth year that I am celebrating Ganesh Chaturthi at my home. It's the biggest festival for our family," says Gowdra. Rajan Ramakrishnan from Mumbai sent us this sketch. 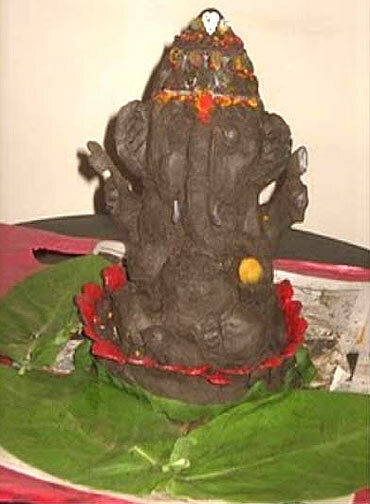 Shanti Lakshmi from New Delhi sent this picture of a Ganesh idol made out of molded black soil from the Godavari River. 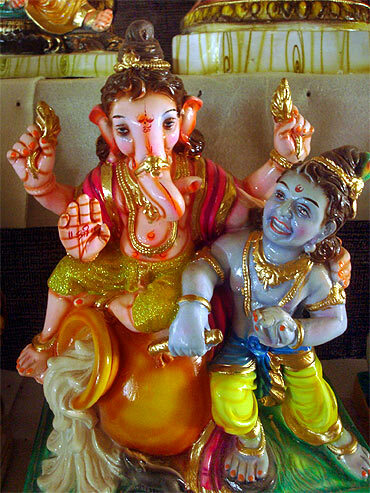 Vinay Rao from Bengaluru sent us this picture of Ganesha with Krishna. 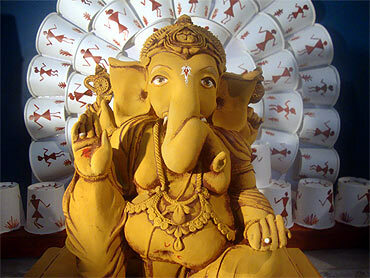 Harish Chengalvala of Morrisville, North Carolina sent this photo of GAnpati made from Haldi (Turmeric) and kum-kum. Anoop Nayyar from Pittsburgh, Pennysylvania sent us this snap. Chaitanya Korde from Jabalpur sent this snap. 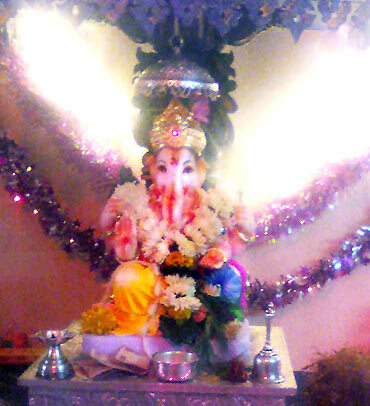 Mandar Joshi from Pune sent this picture. Prashant sent us this snap, which based on the theme of 50 years of Maharashtra's statehood. 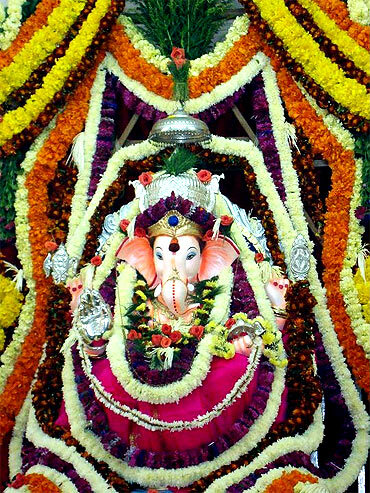 Devanand V Tendulkar of the Shree Varadh Siddhivinayak Seva Mandal in Dombivali sent in this picture. 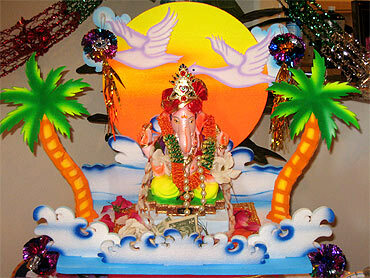 Swanand Gogate from Kalyan sent us this photograph of his eco-friendly Ganesh idol. 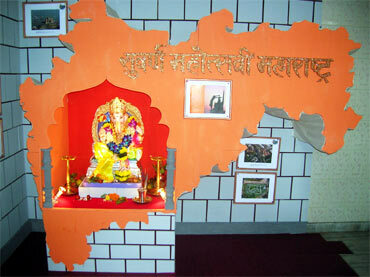 Harsh Devasthale from Kolhapur, Maharashtra sent us this photograph. Anuradha from Dubai sent us this snap. This main idol is actually a fountain which she bought in Dubai and to her surprise discovered that it was made in Malaysia. 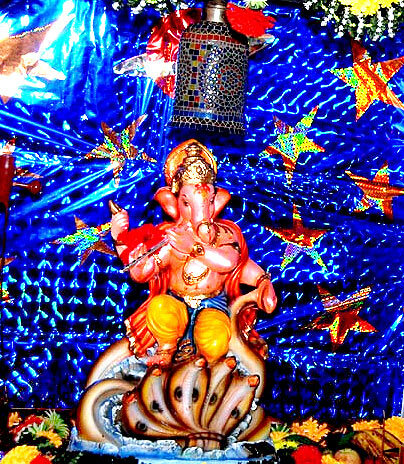 Eleven year old Mohit Rao from Nerul in Navi Mumbai sent us a snap of his Ganesha idol. 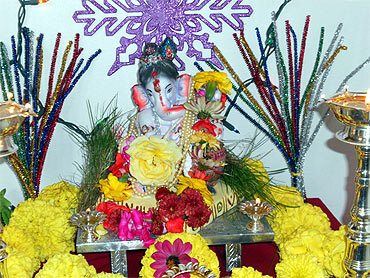 The idol is from Pen, the traditional bastion of Ganpati idols in Maharashtra.